I've been wishing for a car for months. We have one vehicle -- the Bigass Truck, which pulls the trailer that's been sitting in the driveway since September. We keep the truck to pull the trailer, and we keep the trailer because we still want to use it. The truck is great for Rick's handyman business, but it's kind of, uh, large for zipping around town. Not that it matters. He works so much I never have a chance to drive it anyway. Which brings me back to my wishing for a car. I think it would be lovely to have the freedom to leave my house any time I want to. As it is, and has been for many months now, I work at home, and I'm here all the time. This is not right. I tried a borrowed bicycle for a while. 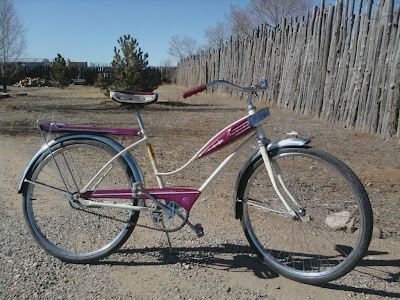 Remember that cool vintage purple bike I showed you a while back? Then a couple of nights ago, a friend offered to loan me her purple Ford Ranger. (Purple again!) She only uses it for dump runs, so it sits in the driveway most of the time, which leads to serious deterioration, according to her mechanic. She just had a bunch of work done on it, and the guy told her she had to drive it more. Of course she'd much prefer to drive her cute little Mini Cooper, so offering the truck to me for a while seemed like a win/win, which it is. So why don't I feel happy? Not unhappy exactly, but there is a lack of happiness. All the spiritual woo-woo stuff I read tells me that the Universe has bigger plans and better stuff in mind for me than I could ever dream up on my own. I've been loosely visualizing a cute little VW convertible... or something better that I haven't though of yet. And while I am very grateful for the wheels in my driveway, I have to wonder if this is how highly the Universe really thinks of me... a big, purple dump-run truck instead of a cute little zippy car? Clearly I'm missing some cosmic point here. I'm well aware that I have a "glitch" when it comes to receiving. I'm great at giving, not so great accepting what others kindly offer to me. I also have a strong aversion to borrowing. Especially expensive things like motor vehicles. I'm not even comfortable in a rental car. Using other people's stuff makes me nervous. What if I hurt it? I like my own stuff. Clearly I have some things to work on here. How can the Universe bring me Great Stuff when I'm so uncomfortable with Any Stuff at all? OK. I get that. But I think there's more to it than just that. Talking to another friend yesterday, she explained to me that even though we are grateful for what is presented to us, and in full knowing that all things are Gifts, we are still Goddesses with a strong need for beauty, and an ingrained urge to create an aesthetically pleasing world around ourselves. That helped. I washed the purple truck -- Ford calls the color Sonic Blue, but they're wrong -- and vacuumed and dusted the inside. I moved all the dump-supplies, tarps, ropes, and motor oil bottles from the cab to the bed, and sprayed the stained upholstery with lavender. Then I hung a magic charm from the rear view mirror -- a St. Christopher medal hooked onto a Captain Jack Sparrow keychain. It's always good to have the protection of a saint when driving in New Mexico, and it never hurts to have a beautiful pirate on your side, just in case. I'm ready. Today I'll take Miss Violet (I had to give her a name, even though I intend this to be a short term relationship) to the gas station for a fill-up and a windshield wash. Then we'll go to the auto supply for a sun shield for the dash. It's a date. We will have fun. And maybe... not sure about this... but maybe if the Universe sees me loving this odd and unexpected Gift, maybe It will find me something closer to my cute little dream car... or something better I haven't even thought of yet. You might find that the little truck is very useful and might even abandon the idea of a zippy little car. When you come across great finds (furniture for yourself or daughter, perhaps "projects"), you won't have to wait for Rick to rescue you and your finds. Or maybe it will help when your daughter actually moves, and then the zippy little car will come along. Have fun with your Gifted transportation that gives you some freedom. Drive the truck. Get a baby seat for the little one, and be a safe happy Grandma. If you want to feel zippy, put a flower behind your ear!